It's almost Mother's Day, so I have made a few cards to show you this week. I am entering today's card in two challenges. The first is Simon Says Stamp Work It Wednesday Challenge and the second is The Color Throwdown. This card is also featured on the Eyelet Outlet Blog today. My floral die cut is from a Silhouette file and behind it I blended three shades of Stampin' Up inks onto white card stock. After matting the entire piece, I added some coordinating pearls. Be sure to check out these great challenge blogs. And there is still time to play along...so give it a try! 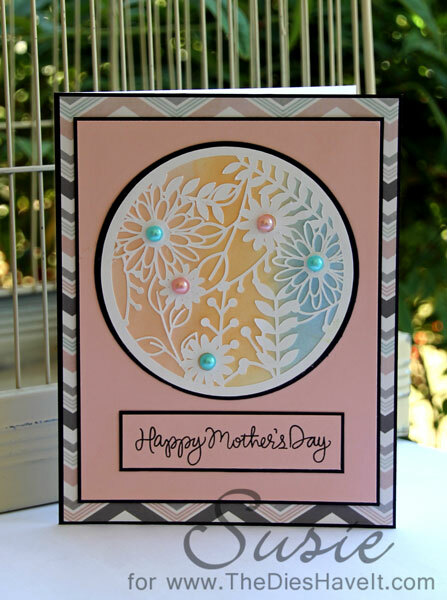 I just LOVE that floral die-cut you used... it is beautiful, and makes for a stunning card! Thanks for joining us for the Color Throwdown. Love the floral die and sponging/blending of inks! Thxs for joining us at CTD! !